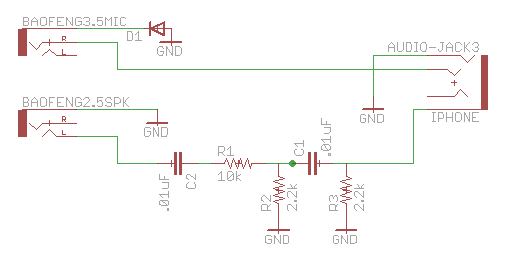 I have a circuit and I am trying to integrate it with an iPhone via a TRRS headphone jack's microphone input. I have a generic TRRS cord and am trying to send a signal through it. However, the iPhone does not detect that a mic is even plugged in. However, if I plug it into my Mac via line-in and record, I can record the signal I am sending perfectly. I have read online that it needs to detect resistance between the ground and mic, which I have. Are there any other things I need to do? It seems like this is an issue that stems from Apple's proprietary technology, as the earbuds are from a Windows Phone before they were spliced. You might want to take a look at this and check if you have the same config. I'm sure android and apple are the same kind (I've used them interchangeably) though samsung android phones have two rings swapped. From my testing, the iPhone seems to need some capacitance in the circuit for it to detect a microphone. I used a variation of the schematic found at http://www.creativedistraction.com/demos/sensor-data-to-iphone-through-the-headphone-jack-using-arduino/ and was successfully able to get audio into my iPhone. UPDATE: @jose.angel.jimenez in the comments says the capacitance isn't necessary. That may well be. My testing wasn't the most scientific. Still, this was the circuit that definitely worked best for me. Impedance (the iPhone mic input) is a little trickier than straight DC resistance. Impedance line-matching has always involved a few passive components (cap's and/or coils). johnboiles' schematic uses some series RC for (I assume) signal matching/conditioning to the iPhone's mic input and he's apparently using the left (?) channel of the iPhone's output to feed the mic input on the ham radio(??). A 1.6Kohm resistor is a workable approximation, but isn't really impedance-matching. The Apple CTIA TRRS is Tip- Left Audio, Ring1- Right Audio, Ring2- Ground, Sleeve- microphone. Not the answer you're looking for? Browse other questions tagged signal iphone microphone or ask your own question. Digital data coming out of a cell phone headset mic?